There's nothing heartless about this recipe~ in fact it's divine! In a large pot of salted water, boil the artichokes for 10 minutes. Take them out of the water and let them drain well, upside down, in a colander. Put the brie in a small pot with the cream and let it melt on a low flame while constantly stirring. When the mix is smooth, turn off the heat and, while stirring, add the yolk, the grated parmesan, the thyme and the crushed almonds. Preheat the broiler to low and position the rack close to the bottom of the oven. 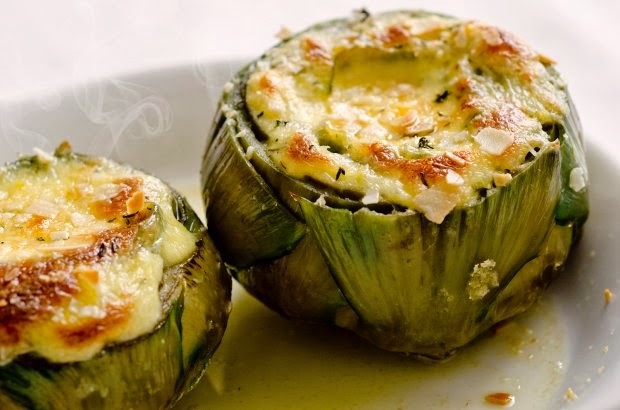 Fill the artichokes with the mix (it should cover the tops as well), sprinkle them with some more grated parmesan and almonds and place them standing head up in an oiled casserole dish. Put under the broiler and let them cook for about 10 minutes, checking often, or until the cheese turns into a golden crust.